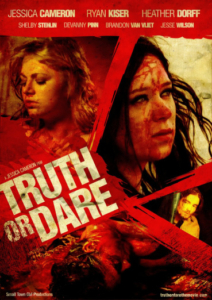 Truth or Dare is about six friends known as the Truth or Daredevils who achieve internet stardom by posting “Truth or Dare” YouTube videos with violent twists. But when their number one fan hijacks a show and decides to play by his own rules, the fun and games come to an end as secrets are revealed and a lot of blood is spilled. A LOT of blood. The film largely takes place in a single room, and I quickly noticed the wonderful mix of dark and bright color palettes on the walls. I found this to be a nice emphasis of the coexistence of good and evil happening inside the room — with the presumably innocent 6 friends taken hostage by a deranged fan named Derik, energetically played by Ryan Kiser. The contrasting colors also echo the same sentiment that exists in the minds of men: the blurring of secrets and truths that we all carry within us. The hiding of secrets is demonstrated in full on cringe-inducing, hard to watch, gory fashion as Truth or Dare unfolds — and the 6 friends are opened up (in more ways than one) for everyone to see. The performances are solid all around, as the actors have to portray endless expressions of disbelief and excruciating pain. Ryan Kiser puts on a show that sometimes teeters on the brink of being over the top, but he has just enough vulnerability on display to reel him in. He is overall very effective in the role. Heather Dorff is the standout amongst the YouTube group, as she withers in pain and expertly displays pure raw emotion in her eyes to match the expressions on her face. 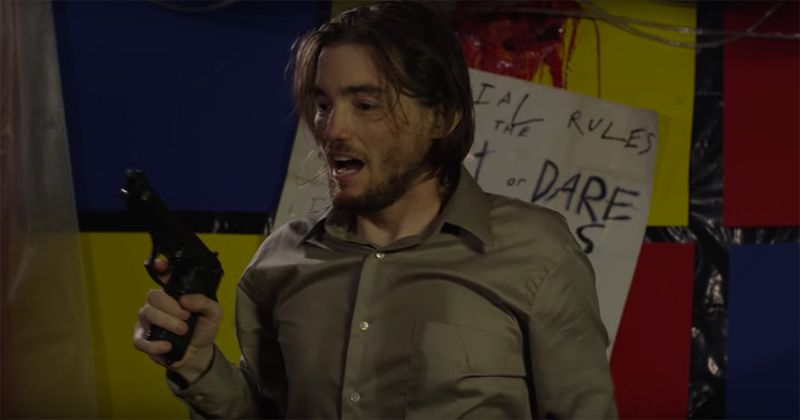 The film makes a strong statement about what’s accepted as reality on the internet. 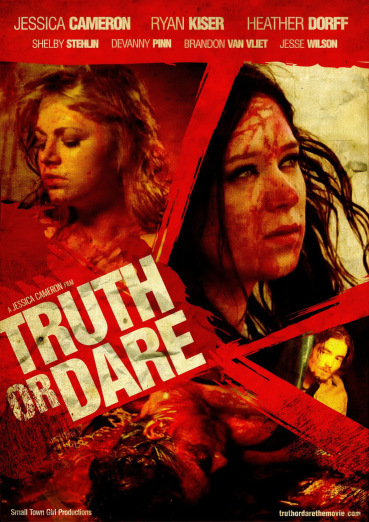 Director Jessica Cameron puts the themes of Truth or Dare on full, gory display as she dismantles common beliefs and ideas and turns them inside out. The unknown lives that are discovered amongst the group of friends who thought they knew each other, combined with Derik’s thinking the carnage is all part of the game, says that perception is not reality but, instead, reality is perception. The film says reality is decided by the individual and how they choose to see it. And when reality has several different interpretations, you’re left with a fucked up mess that exists outside the realm of known reality. And this is where the more over the top sequences in the film are forgiven, because they lay outside of a known reality; a place created by the fragility of the human mind, it’s instinct to protect itself, and its dangerous ability to escalate chaos. That may seem a little deep for a gory film about a bunch of YouTubers, but the script is very smart and Cameron’s direction shows that an unthinkable situation requires unthinkable acts to happen within it. Even Kiser’s Derik character exclaims, “I didn’t think that would work!” or acts surprised by a few of the gory things that happen because of his doing. It’s not the reality any of them are used to. When all the truths have been told and all the lies exposed, the mind goes to an unknown and dark place, escalating the chaos as it tries to protect itself. And that’s Truth or Dare: an experiment in escalating chaos. The film was a part of a crowd fund campaign and all crowd fund campaign orders are being worked on and will be sent out shortly. VOD and additional locations will be added over the next 2 months. All information, including where to buy the film, will be posted to the film’s facebook page: Facebook.com/TruthOrDareTheMovie/.